The score unit is inside the cabinet, below the playfield, and at the top portion of the cabinet. It consists of two score wheels and the solenoids to increment them up one step at a time and reset. 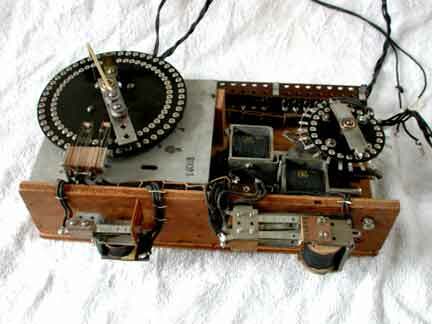 The buttons on the wheel are connected to the terminal strip at the top right, which are connected to the score board lamps. The unit is powered by 12 volts but activated by six volts. This picture shows an attempt to add a line powered power supply. The transformer, partial diode bridge and capacitor were removed. Replacement batteries are being sourced in order to preserve the ability of the game to rotate. See additional information on Confucius Say, by Rotor Table, 1936. Each time the ball touches a scoring spring, the small, six volt relay mounted on the vertical board on the left, pulls in. These contacts provide a 12 volt power impulse to the large score wheel on the left. Each button is connected to the terminal strip mounted to the upper right of the flat, horizontal board. The contact of the score wheel provide power to light score lamps in the score board. In this implementation, the score wheel counts 19 impulses. On the 20th impulse, the arm extending to the top of the wheel rotates around and contacts the leaf switches at the bottom of the wheel. This causes the other small relay on the front of the board, on the right side, to pull in and latch. The leaf switches then power the small score unit and cause it to increment once and causes the large score unit to reset. Upon completing the reset and rotating back to zero, the contact arm hits the other side of the leaf switch, at the bottom of the score wheel. These switches break the latch of the small relay, completing the cycle. Now the large score wheel is set back to zero, but the small score wheel has incremented once. In practice, the smaller score wheel increments every 20,000 and lights corresponding lamps in the score board of 20,000, 40,000, and 60,000. The reset circuit is crude, requiring two large solenoids and two smaller solenoids to be pulled simultaneously. The two large solenoids power the resets on the score wheels, allowing the pointers to rotate back to zero, and the other two power those. The score wheels will acomodate different logic sets, allowing increments of different amounts. They are made of plastic, not bakelite and have steel brads, not the more normal brass. The frame of the larger wheel is stamped with a symbol and "patent applied for". The coil wire is wound on . 5 inch inside diameter brass sleeves, making them not removable. In trying to disassemble and clean the mechanism, I found many of the threads staked or punched in order to prevent them from loosening during play. This makes repair very difficult. The designers may expect the games to last only a short time and not need maintenance. The small score wheel is returned by a flat spring similar to those found in a barrel spring in a clock. The return spring on the large score wheel was the familiar wire return spring found in modern score units. Coil stops were adjustable, with a bolt and lock nuts determining the depth of the stroke. The leaf switches were all as expected in relays or contact sets found in later electronics practice.